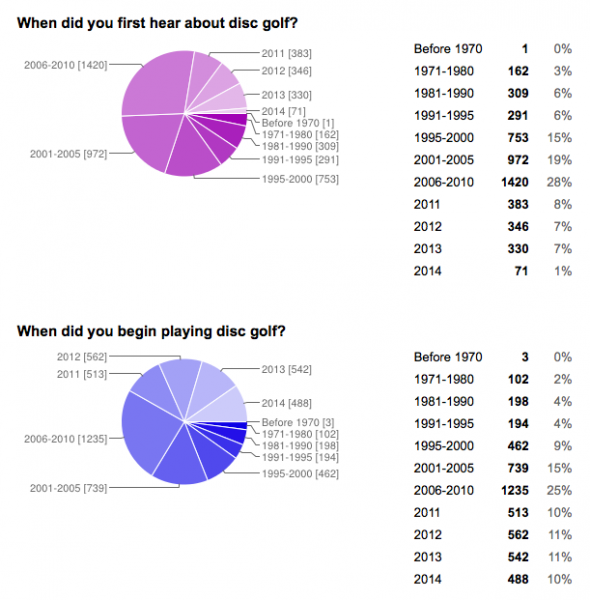 State of Disc Golf 2015: Do Our Demographics Affect Our Choice of Brands? 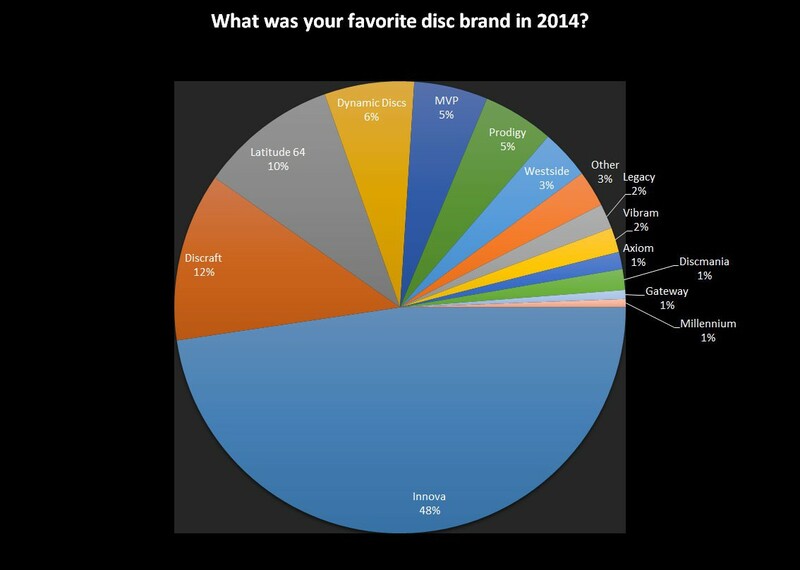 In a previous blog discussing the results of the 2015 State of Disc Golf survey, we focused on which disc golf brands we like the most and how that has changed from last year. (If you missed it, click HERE) This blog will look at who we are and whether that affects what brands we throw. According to the survey, we are male (94%), live in California (7%), are 30-35 years old (23%), consider ourselves Intermediate disc golfers (45%), have been playing for 5-9 years (25%), played 10-15 different courses in 2014 (29%) and have a Bachelor’s Degree (35%). Half of us are currently married, while 43% have never been married. We also belong to disc golf clubs (57%), own either 21-30 discs or 41-60 discs (tied at 14%), bought 10-14 new discs last year (18%), lost 1-3 discs (48%), chose disc golf as a favorite sport to play (85%), and football as a favorite sport to follow (35%. Disc golf was second at 27%). After examining all the demographic statistics, we wanted to see if there were trends based on certain aspects of the demographics. For example, does the age of the respondent affect which brand they consider their favorite? Or the skill level? Or the education? We considered most the attributes of the average survey respondent, listed above, and compared them to the overall list of favorite discs. And, spoiler alert, the results were kind of boring. Regardless of the demographic, nearly all of the results were within a point or two of the overall favorites. There were only a few exceptions, and even those were not extremely far from the overall numbers. They are worth mentioning, though, because of possible long-term ramifications. Just to recap the previous blog, the top six favorite brands were: Innova (48%), Discraft (12%), Latitude 64 (10%), Dynamic Discs (6%), and MVP and Prodigy tied at 5%. The first question we looked at was “When did you start playing disc golf?” We wanted to see if the length of time we have been playing had any effect on which brands we preferred. The biggest variation from the average results occurred among players who have only been playing a year or less. This was not a large sample size, representing only about 1.5% of the total respondents, so the overall significance of the results carry less weight. Still, this will be an interesting group to watch over the next couple of years. Players from this experience group still chose Innova as their favorite brand, but by a much smaller margin. Only 31% of respondents in this group picked Innova as their favorite, compared to 48% overall. Discraft and Latitude 64 results stayed close to the same as the total results. MVP, Dynamic Discs, Axiom, and Discmania all bumped up several percentage points (see chart for numbers). Near the other end of the experience spectrum were those who have been playing between 35-44 years. This group made up 3.2% of the respondents. Among them, 42% listed Innova as their favorite, while 15% of them chose Discraft, 3% more than overall. MVP, Dynamic Discs, and Prodigy all held 8% of the vote in this group, which represented an increase for all three brands. Westside was consistent with their overall score. The survey asked respondents to list what division best represented their skill level. The four choices were: Beginner/Recreational, Intermediate, Advanced, and Professional. For the most part, this category also followed the Favorite Brand category nearly exactly. The Pro’s, representing 8% of the total respondents, had the biggest differences. For them, Innova sat at 46%, Discraft and Latitude were 10%, and Dynamic Discs, MVP, and Prodigy held 7% of the Pro vote. Since men represented 94% of the respondents, it’s pretty obvious their statistics would duplicate that of the overall results. For women, there were a few slight differences. Innova was the first choice with 46%, which was 2% lower than overall, Discraft took second with 11%, and Dynamic Discs rounded out the top three, finishing 9%, up from the overall 6%. Latitude 64 and Westside traded a couple percentage points, with Latitude 64 2% below the overall results and Westside 2% above. The final demographic we’ll look at in this blog is the choice of Favorite Brand by age group. While all of the age groups between 18-40 years were close to the overall percentage, there were other groups with a few different numbers. Again, the differences were never huge, but enough to mention. 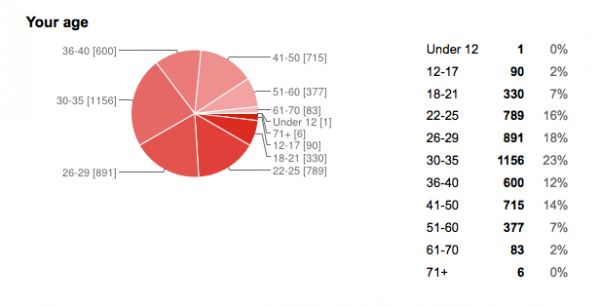 We will start with the youngest age group, 12-17 years old, which represented 2% of the total respondents. Like the newer players that we mentioned at the beginning, it will be interesting to see how or if the numbers in this demographic changes over time. The youngest players chose Innova as their favorite by 5% more than the overall respondents. The increase came at the expense of Discraft and Latitude 64, which were both down a little. Westside was chosen 3% more frequently, while Dynamic Discs was the same percentage as overall, 6%. The next group to look at is disc golfers 41-50 years old, representing 14% of respondents. This group chose Innova at a slightly lower 43%, compared to 48% of average. Discraft was up to 14%, Latitude 64 was up a tick at 11% and Prodigy was 7%, which was 2% higher than overall. The 51-60 year olds were a little more favorable for Innova, with 53% of the group choosing the brand leader. Discraft and Latitude 64 were a little less popular, while Dynamic Discs and MVP matched their overall numbers. The most senior group we will look at is the 61-70 year old disc golfers. They make up 2% of the total and only 39% of them favored Innova. The extra percentage points went to Discraft (16%), MVP and Westside (9% each), and Dynamic Discs (8%). The fact that Discraft is higher is not surprising. But, if we were going to bet on a demographic that would have the highest loyalty to Innova, we would have gone with this one. Innova and Discraft have been around longer than the other brands and people in this age group grew up throwing those discs. When we were looking through all of the data, we were hoping to find a few statistical anomalies that could be analyzed and discussed. Although this particular set of data did not have the extremes we were hoping for, just knowing that we as disc golfers are consistent throughout a variety of demographics is good information to have. We will certainly keep an eye on those groups that did vary from the norm to see what changes take place in future surveys. In an upcoming post, we will look specifically at which brands people are throwing. Remember from the first survey result blog that only 6% of us throw a single brand. The rest of us have two or more brands in our arsenal. We will look at which brands people throw and which new discs people know the most. I usually throw a little Vibram, Discraft, and Latitude 64. However, I just started to throw Salient discs and I like them a lot! Good read, I was hoping to see some anomilies as well… But I suppose the lack of significant change goes to show that the survey collected accurate data for a variety of groups! I love Westside. Just started playing not to long ago but I really love my Westside World. It feels great in my hand, and it throws pretty straight.